Thank you for attending Jenny's Pivot workshop! along with additional free tools and templates mentioned during the session. You will also receive Jenny's weekly #PivotList round-up with her latest podcast episode, as well as recommendations on what she's reading, watching, listening to and favorite tools found 'round the web..You can unsubscribe at any time. To get a feel for what these updates are like, check out the archives. Thank you—an email with all the goods is heading your way! Pivot Toolkit: A library of all tools, templates, and resources corresponding to the exercises in the book and grouped by the four stages of the Pivot Method. Ideal Day Mad Lib: A personal favorite coaching exercise that didn't make it into the book. Pivot Mastermind Kit: An exclusive toolkit with pointers (and templates) for forming and leading your own #PIVOTMastermind Group. Pivot Podcast: My podcast that explores what's next for your career and creative projects. Learn how to embrace fear, insecurity, imperfection and intuition as the superpowers they are while navigating the pivot process. Momentum: My private community for side-hustlers and solopreneurs. 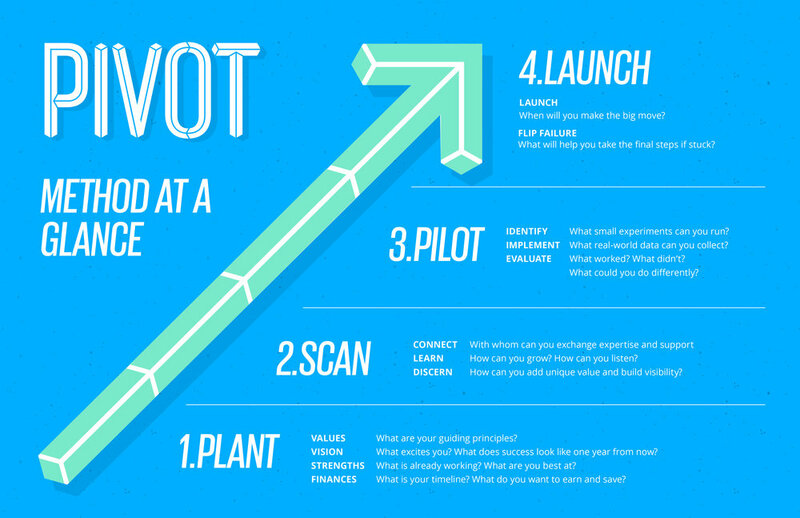 Pivot Jumpstart Coaching: Personalized, one-on-one support to kickstart and accelerate your pivot.